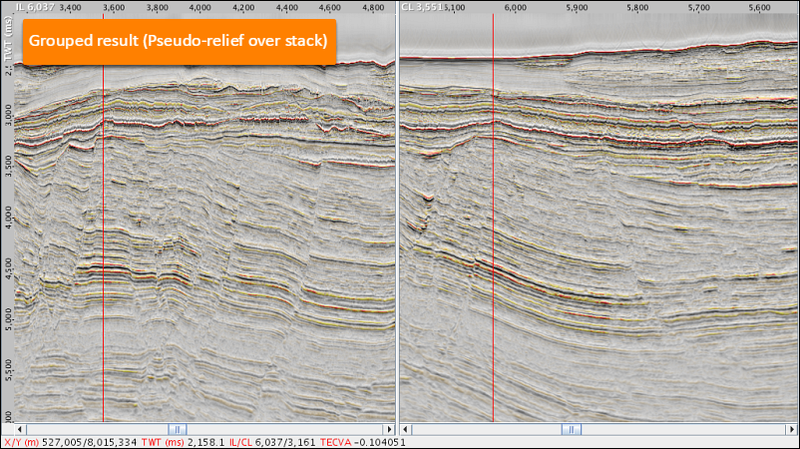 Generating a pseudo-relief attribute (also known as TECVA) can assist with structural interpretation. 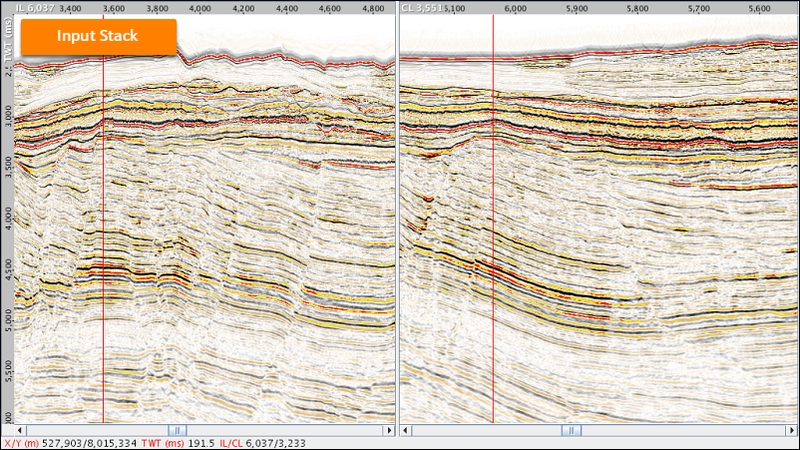 It is often easier to correlate events on the enhanced reflectors, simplifying both fault and horizon interpretation. 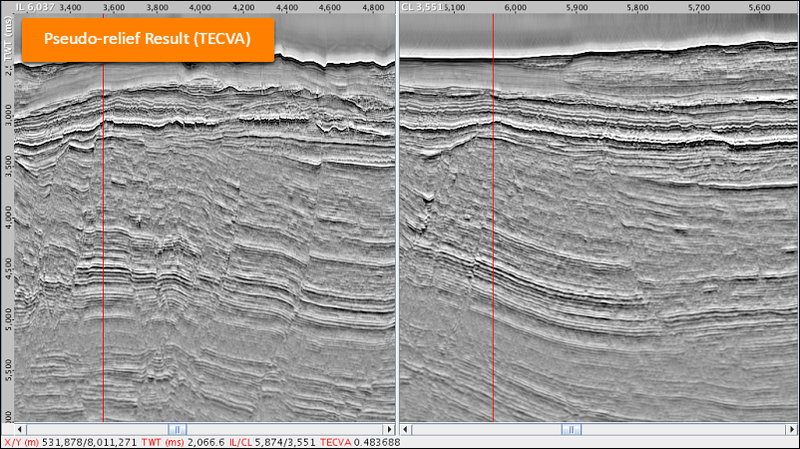 Reference: Bulhoes, E. M., 2005, Principio da SismoCamada Elemantar e sua aplicacao a Tecnica Volume de Amplitudes (tecVA). Ninth International Congress of the Brazilian Geophysical Society. 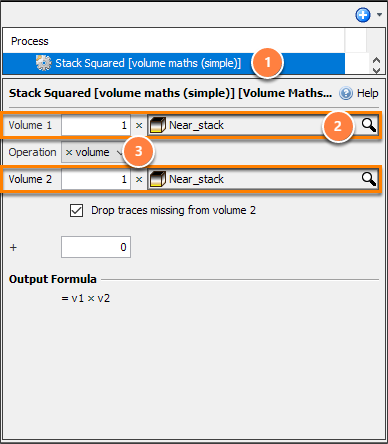 Go to the Process tab, add a Volume Maths (Simple) process (see Volume Maths Process (Simple)). Volume 1 and Volume 2: Select the input stack. Use the multiply operation: x volume. The result will be a selectable volume. Next, average the squared input stack from the previous process. 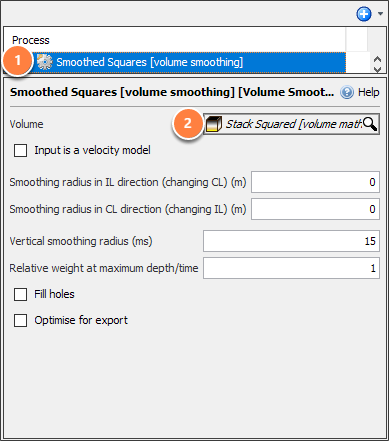 In the Process tab, add a new Volume Smoothing process (see Volume Smoothing). Volume: select the created volume from the previous process. A new volume will be created. Next, find the square root of the average (from the previous process). 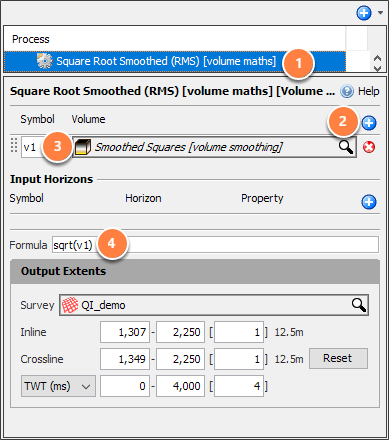 Add a Volume Maths process from the process tab (see Volume Maths). Click the blue "+" in the Volume Maths panel. Symbol: v1 - select the volume created from the averaging steps. A new volume is created. 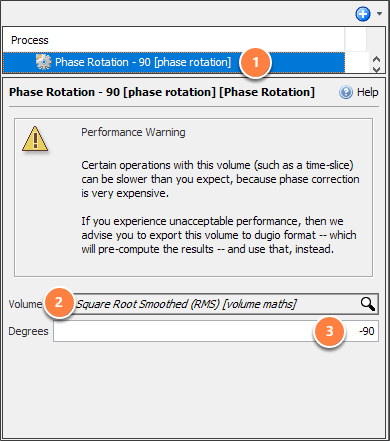 Phase rotate the pseudo-RMS using a process. Volume: select the square root volume. The new volume is created. Finally, apply a Low-cut filter to remove low-frequency vertical striping. 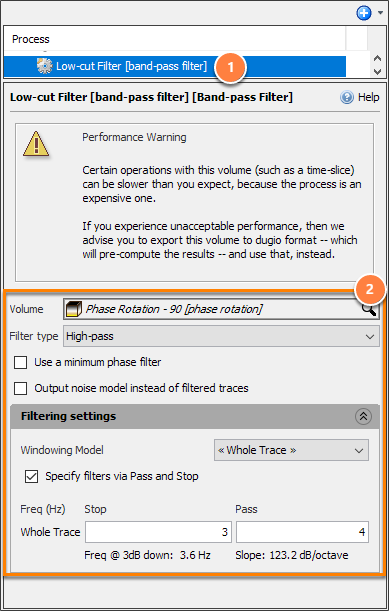 In the Process tab, add a Band-pass Filter process (see Band-pass Filter process). If the result looks "smeared", try increasing both the Stop and Pass values by 1 or 2 Hz. Prev: How do I create "fake" source and receiver headers from offset values? Next: How do I create a "chair" display in the 3D view using two different volumes?